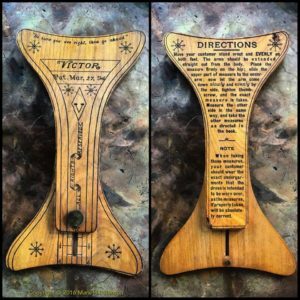 Patent number 517,079, for a tailor’s adjustable measure, was awarded to Mr. William Veitch (a subject of the Queen of Great Britain and Ireland), residing in Kansas City Missouri on March 27, 1894, which date is proudly proclaimed on the device itself. The style in which it is decorated gives the device a very folk-art feel. One element of this decoration is a quote from the late, great Davy Cr…ockett: “Be sure you are right – then go ahead!”. This, in fact, is what caught my eye the first time I saw one of these, and why I have long looked to add one to my collection – I’m a bit of a Davy Crockett fan! 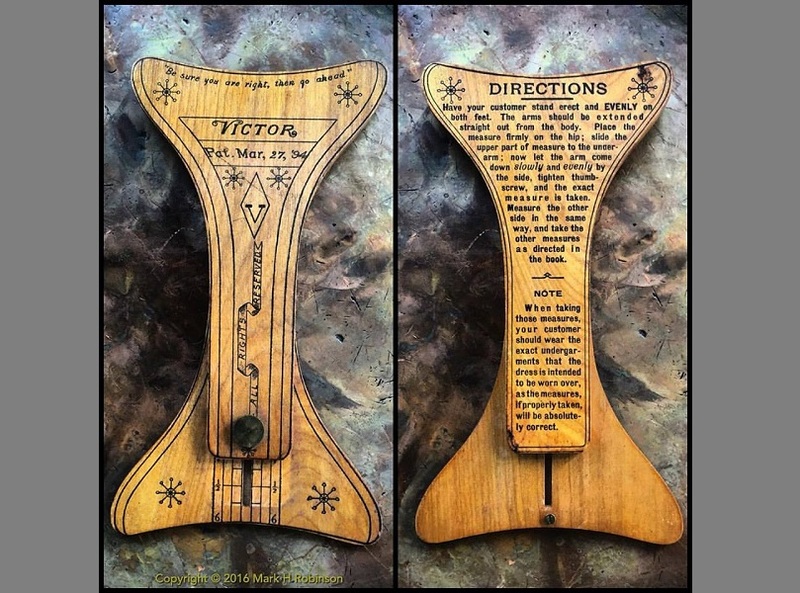 It fits nicely in my now-extensive collection of rules, measuring devices and tools of the tailoring trade – but would also be of interest to many collectors of ephemera and advertising. I don’t normally write about price (or value, depending on which side of a transaction you happen to sit), but I get many, many questions on that topic, so I’ll use this one to illustrate a point. A dealer in San Francisco recently sold one of these for $155 – which I think was a fair price for what is a very scarce and quite attractive item… I missed out, but probably would have paid that much. However, as serendipity would have it, this one came my way recently for $25! In the world of old stuff, the truth about the value of any antique or collectible item is simple… It is whatever a willing buyer will offer, and a willing seller will take!